Skegness was once a haven town, built on a raised promontory with a harbor trading in timber and other merchandise. The name like many others in the area, relates to the Danes, Skeggi's 'ness' or headland, one of the places where the Vikings landed in the ninth century. The haven port was washed away in 1526, the storm tide breaking up the raised ground, now buried up to a mile seaward. The traveling antiquary, John Leland, wrote in his 'Chronicles' a few years later that: 'Olde Skegnes is now builded a pore new thing.' As indeed it must have been, built by poor people deprived of all they possessed. By the 1850's the village still had less than 400 inhabitants, a few earning a living as fishermen and the rest employed about the farms on what was some of the richest grazing land in the country. 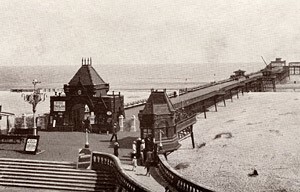 The gentry from not too distant places brought their families to indulge in the fashionable practice of sea-bathing during the summer months, but it was not until the railway reached Skegness in 1873 that visitors began arriving in large numbers. They were the new day trippers from the working classes, but all there was for them were four hotels, two or three refreshment rooms, the sea and sands and several bathing machines. 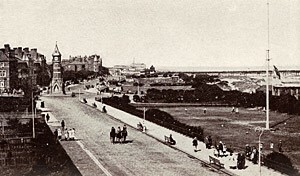 Most of the land belonged to the Earl of Scarbrough (who lived in Yorkshire) but, believing that the seaside would become more and more popular, he engaged an architect to plan a model watering place as the Victorians called them, on the site of the existing village. 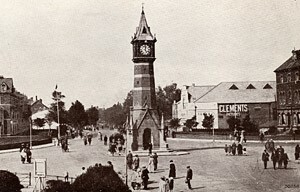 Work began in the late 1870's building wide, tree lined streets promenades and gardens, a park and a pier, as well as a new main shopping street, a church and lots of new houses. When the new century began, the Skegness population had risen to well over two thousand, with new residents coming from Nottingham, Leicester, Derby and other areas to set up their businesses. Through the Edwardian years the new seaside Town continued to grow, attracting more visitors each year, as the earl had predicted, and soon after the Great War ended he sold the whole of the seashore to the Skegness District Council for a very reasonable sum. In the twenty years that followed, between the World Wars, the local authority laid out the basic amenities we know today from what had virtually been the sands and the dunes. They included rose gardens and walks, a boating lake and bathing pool, waterway, amusement park, bowling greens and tennis courts, the Embassy Centre and other attractions, whilst new hotels, entertainments and shops continued to proliferate. The Town suffered heavy bombing during the war years, as well as occupation by the armed forces, and there was much repair and refurbishing to concentrate on in the late 1940's, as well as extra housing for the newly returned servicemen and others. Then an industrial estate was laid out to attract all year round jobs and an improved road system to facilitate the movement of the ever increasing volume of motor traffic. The 1950's indeed saw the age of the motor car really arrived and visitors flocked to the coast under their own power instead of on the trains and new car parking space had to be provided, near the sea, as well as a wider choice of accommodation. Caravan camps were popular in Skegness in the 1920's and 30's but after the war they expanded on a huge scale to make this the most popular caravan coast in the country. Hotels and guesthouses were upgraded to meet higher standards and Butlin's Skegness Holiday Centre was also modernised at considerable expense. Skegness got off lightly in the great East Coast Flood of 1953, but the sea defences were then strengthened and new promenades built on the sea walls. In 1978 another great storm almost destroyed the pier, but what remains has recently been repaired and improved. As the new century gets under way, in spite of the rush to the sun, 'Skeggy,' on the drier side of Britain, is still a regular point of call for thousands of people from the East Midlands and elsewhere. With its fine sand beach, flying the blue flag of excellence, it is a paradise for children and there is a wide choice of activities for all other ages.